This is a dainty sterling silver pendant, inspired by the famous Celtic legend of the Children of Lir. 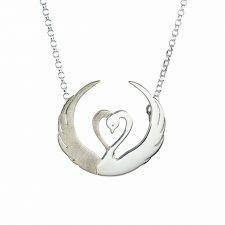 This quality silver pendant depicts two swans entwined to create a heart. One of the swans is sandblasted giving a lovely textured effect and creates the illusion that one swan is slightly behind the other as they embrace. This Celtic Jewellery is handcrafted in Dublin by Tracy Gilbert. The Children of Lir Pendant is handcrafted from Sterling Silver and hallmarked in Dublin Castle. 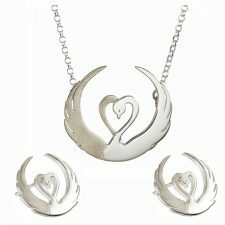 This piece is inspired by the old Irish legend about four children who were turned into swans for 900 years.The children remained together as swans for the rest of their lives. 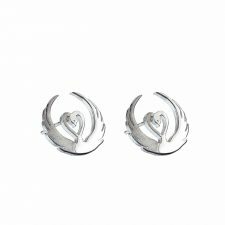 The two swans entwine to form a heart, symbolising Love and Dedication. Bought this for my Goddaughter for her confirmation gift, it is stunning and she loves it, thank you.